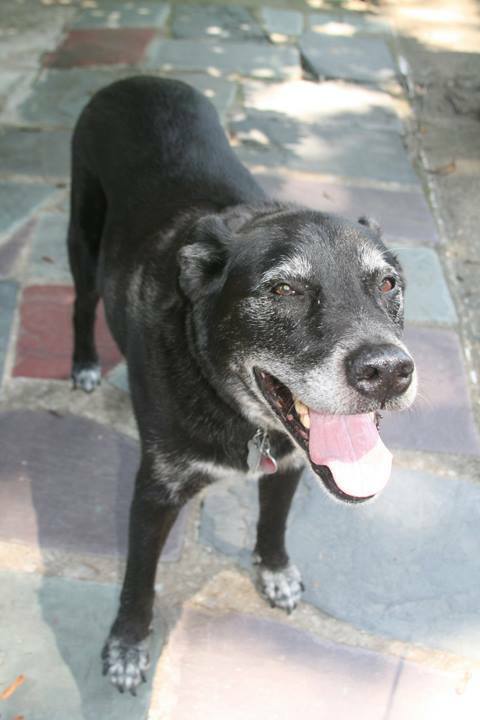 The final day of summer 2014 also proved to be the final day of life for my family’s pet dog, Rocket, who would have been 15 in October. Flashback to 1999. When my parents first brought him home to meet the family, I was a student in high school—today, I’m teaching it. Where does the time go? Rocket was a part of my life for nearly half of my life. And while I haven’t lived at home with him and my parents for a few years now, my fondness and affection for him only grew as he aged. This unexpected 30 for 30 entry is my way of grieving this loss and memorializing his life. Rocket was a good dog, and he was truly one of a kind. Read on for all that I will remember about Rocket. 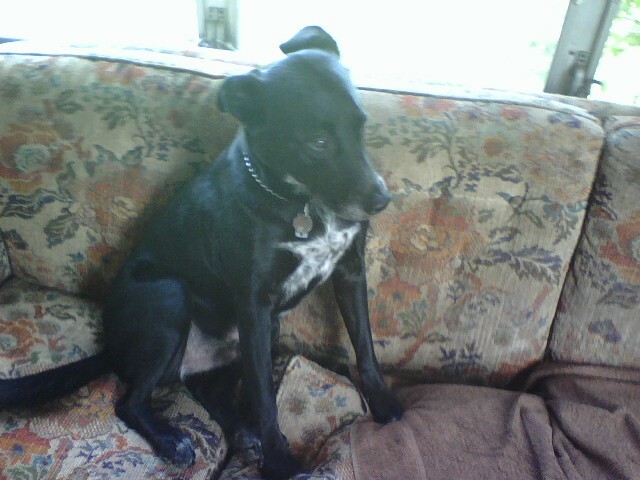 Rocket was a black lab/dalmation mix. He had primarily black fur, but he also had white fur in the shape of a star on his chest. Whenever he heard someone coming in the back door, Rocket was quick to greet them and alert everyone at home with his bark. In his younger days, Rocket had to be locked in a cage when he was left at home. Simply saying the command “cage” was all it took, and he would finangle his body in a way that it fit inside his close quarters. Like me, Rocket was very selective about his circle of friends. He did not particularly care for sharing the spotlight with any other dogs that visited throughout the years, although he tolerated some more than others. The basic pattern was that whenever someone would try to take his photo, Rocket would turn his head away from the camera. However, when someone would try to take a photo of other family members, Rocket would very often work his way into the frame to photobomb them. The saying went that Rocket cheered for the teams who shared his colors, which made him a fan of the NBA’s Spurs, NHL’s Kings, MLB’s White Sox, and of course the NFL’s Raiders. We bonded over that last one. Rocket had an unhealthy addiction to tissues, particularly used tissues. He was known to ravage garbage cans for them. He would even try to pry them from out of my pockets. In his peak years, Rocket was quite the athlete. He leapt through hula hoops and snatched Frisbees in midair with ease. 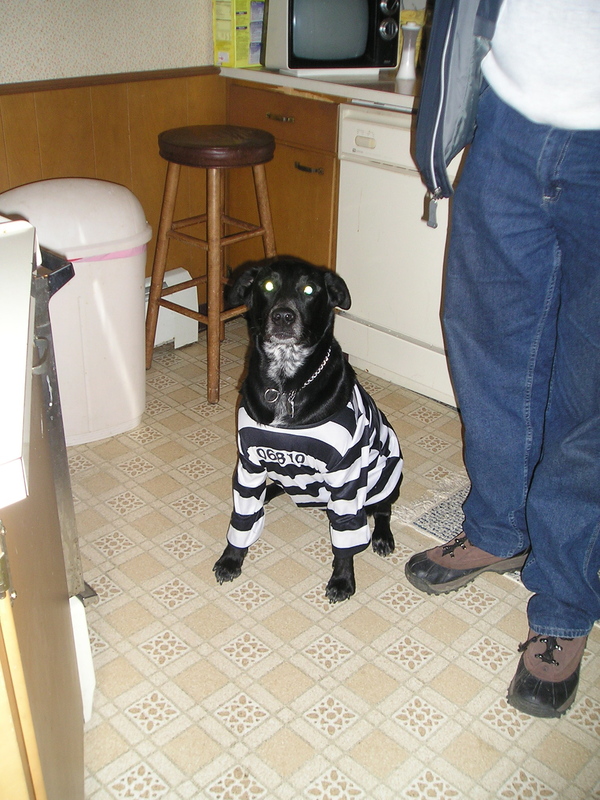 From Halloween to Christmas, family members would try to coerce Rocket into wearing costumes. He was NOT a fan. I always tried to have his back, but eventually, he’d get forced into the costume, providing some ridiculous photos over the years. He was very tough to defeat in his prime. He would grip the rope in his teeth, and he would tug and shake and pull and tug and shake and pull, almost pulling my arm out of its socket. Occasionally, I think he would let me win just so he could then go fetch. Although he would nervously pace on the pool deck, terrified of falling into the pool, Rocket otherwise loved the water, including a good hose-bath in the summer. There are not a lot of things I like about snow, but the first snow fall was a bit more bearable knowing how much Rocket enjoyed running through the snow. He also enjoyed following my dad around on the tractor as he plowed all winter long. It’s a hard thing to describe, but he made some strange noises at times when he was nervous and anxious. He was a champ at eating the entire bone, leaving no traces left behind. He would work tirelessly at it, gnawing with his teeth while struggling without the benefit of opposable thumbs to keep it in place. But he was so persistent. He was ambidextrous with the “shake” command, and he also knew several other commands, although “roll over” was always a bit of a struggle—in his younger days because he was such a spaz, and in his later years because it was too much work for his old body. This was a weird thing that I think I did at least once every time I saw him. It really annoyed my mom, but I always insisted that he liked it. In fairness, he never complained, and he never bothered to fix them himself, so maybe he really did like it. After dozing off on the floor in front of us while we watched TV, Rocket would occasionally have little spasms of his legs, making it look like he was running. 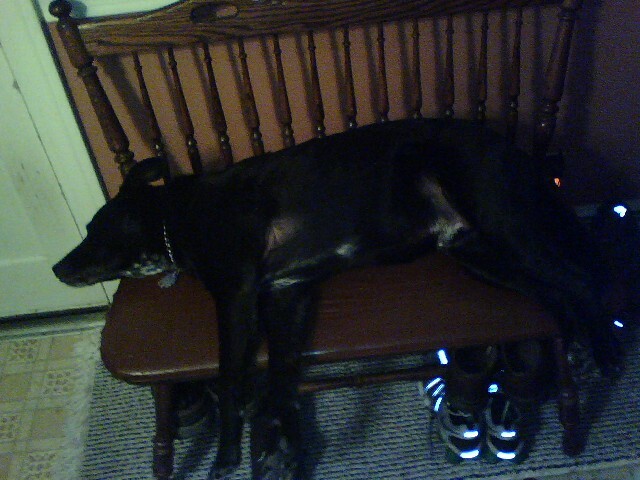 He always speculated that he must have been having a good dream about chasing after a bunny. My parents have a big, open yard out in Fairview. Despite never being fenced in, Rocket was never threatened to run away. He would wander about the yard and venture into the next door neighbor’s yard from time to time, but he would always come back. It got to the point when we had to make a point to close every door in the house when we left Rocket at home because if it was open, even a crack, he would likely find his way in and get into something he wasn’t supposed to be in. Food, slippers, garbage, and the aforementioned tissues were among his favorite targets. In contrast to his name, Rocket sometimes opted for the “slow and steady wins the race” method of hunting prey. His slow creep would often start from 50+ yards away. He would veeeeerrrrryyyy slllllloooooowwwwwllllly take one step toward the animal and then stop. Then he would take another step. And stop. This pattern would go on for minutes, until finally, one of them would break into a sprint, which always ended with the critter escaping into the woods and Rocket prancing back home triumphantly as if he’d warded off an enemy threat. Rocket was a fixture at the legendary Hubert bonfires, prowling around the outskirts of the fire, looking for discarded plates, fallen hot dogs, and the like. 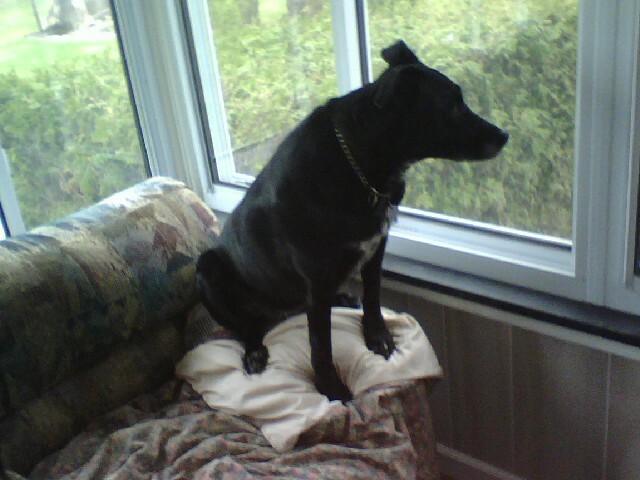 In the post-cage days, Rocket spent most of his alone time isolated on the porch, where he had a perch on the couch that afforded him a great view of the back and side yards as well as a the driveway. That meant he had the perfect view to wait for the arrival of my dad, which was the most exciting and important thing to ever happen in history, every day, according to Rocket. When he was sitting on the porch and he spotted an animal—anything from a woodchuck to a deer—Rocket would leave his perch on the couch, position himself at the back door, and begin panting and barking feverishly. As soon as someone in the house came to let him out, he exploded out the door, often launching himself off the staircase in a single bound and sprinting towards the woods in hot pursuit of his would-be-prey. He made a few kills over the years, but for the most part, the thrill of the chase was all the fun he needed. We’ll never know what would’ve happened if he ever did catch one of the deer that towered over him in size. Rocket insisted upon leaning back into your leg as he sat while I was petting him. Additionally, when he was laying down, he often put his neck across a bar or an armrest, seemingly choking himself. He had a strange sense of comfort. I never made a habit of feeding Rocket “people food,” but if I could have given him one last meal before he died, it undoubtably would have been a greasy, cheesy, loaded-with-meat pizza. As I mentioned before, Rocket wasn’t always the most social dog, but he perked up real quick if you had pizza on your plate. One of my last memories of Rocket was from the opening Saturday of college football season. I was watching the game with my brother Mike and Mark Demski in the basement. Rocket’s health made it very challenging for him to climb stairs, but when he had a meat lovers stuffed crust Pizza Hut pizza down there, he made the trek down. Stubbornly, I refused to give him any no matter how hard he begged. I think Mike eventually caved in, and I’m glad he did. Rocket earned that bit and then some. Speaking of Mike…early in Rocket’s life Mike made the declaration that Rocket’s full name was Rocket James Balboa Johnson III, and he often shortened it to Jim. In truth, the name Rocket was fitting for him as his speed as a youngster was really something. Former Raider Rocket Ismail also happened to be one of my favorite athletes of all-time, so the namesake was extra meaningful. As a senior in college, my senior project was a portfolio of poetry that consisted primarily of persona poems—poems written in the voice of someone else. My favorite poem from the whole project was the poem titled “Rocket” that I wrote in his voice, or what I imagined it to be. You can read it here. Christmas won’t be the same this year. Rocket loved presents. He didn’t care if the present was his or not. He loved ripping up the wrapping paper and helping everyone open their presents. His love of opening presents made me enjoy getting him goofy gifts—everything from squeaky chew toys to old socks that I wrapped up—and watching him open presents quickly became one of my favorite holiday (and birthday) traditions. The one thing that most people will remember Rocket for is his devotion to my dad. Man’s Best Friend doesn’t do it justice. He was his shadow, his companion, the love of his life. 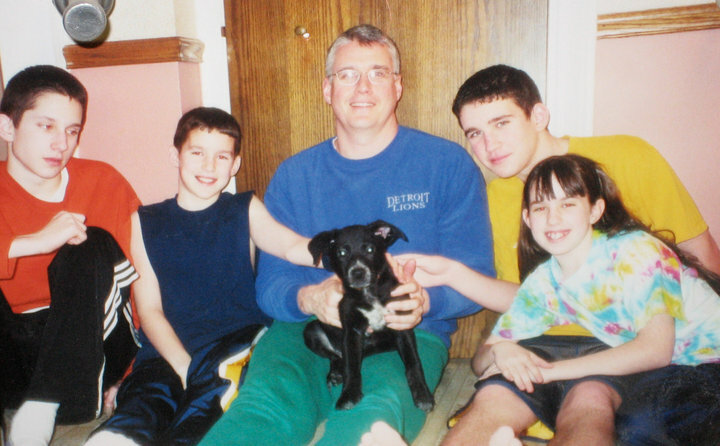 Rocket liked all of us in the family, but my dad had a special place in his heart. They began their days together at 4:15 a.m. and went for a run. He had a bed out in the studio where they would hang out together. He followed my dad when he was cutting the grass. If my dad went out to get the newspaper, Rocket went with him. If my dad went downstairs to get a drink, Rocket went with him. If my dad went to the bathroom, Rocket got up and sat outside the door until my dad reappeared. 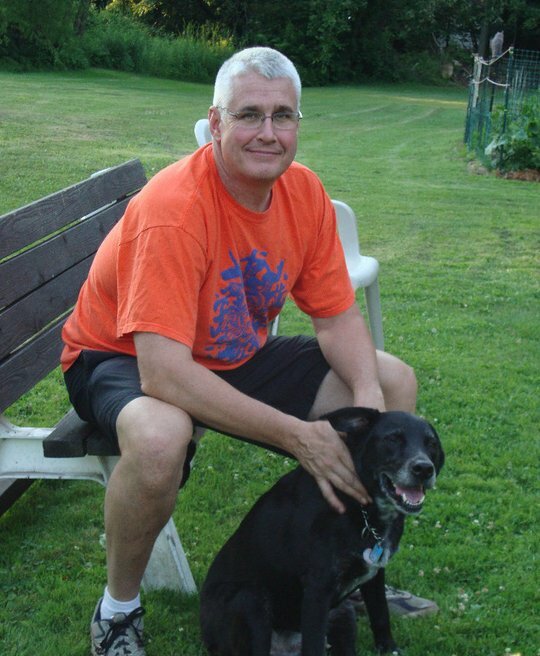 His loyalty and devotion to my dad was unlike anything I’ve ever seen from any other animal, and many dog-owning people who met him said the same thing. I married into a dog-loving family, so I owe Rocket a special debt of gratitude. If it weren’t for him, I probably never would have become a dog lover, or at least not as soon as I did. Recently, when I turned 30, Jessie gave me a book with birthday messages from 30 friends and family members. I’m really glad she included Rocket among that group of 30. 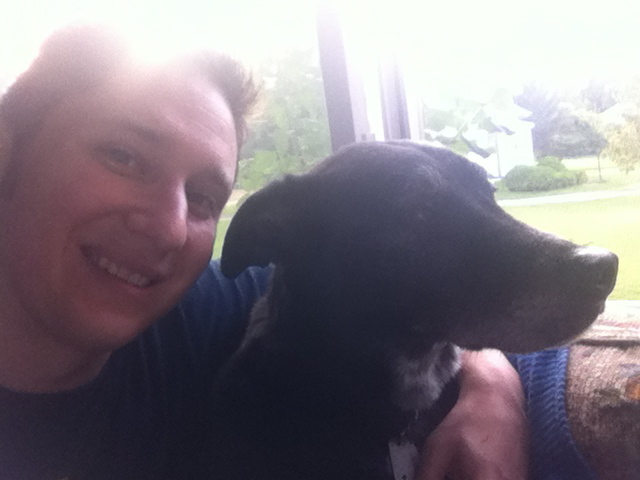 The message from Rocket read, “I brag to all my pals that I turned teenage dog hater Matt into an all-time dog love. I am proud that you can call me your first and best!” I’m tearing up as I read that now. Thanks, Rocket. Rest in peace, buddy. I’m going to miss you. Thank you for sharing. I was touched by many of your 30ies writings.